Because of the wide availability and reasonable pricing of beer, you may want to keep a record of the beers you taste and your reactions to them. You can write down a full profile of a beer in only a few sentences. You can use the form prepared by the American Homebrewers Association, or you can easily organize your own notes on plain paper. Although all the details are interesting, it’s the bottom line that counts. Is the beer good, or is it not? You don’t have to be a beer expert to do your own beer evaluations at home. As long as you have access to a decent variety of beer styles and beer brands, you can begin your novice beer judgeship in the comfort of your own abode. 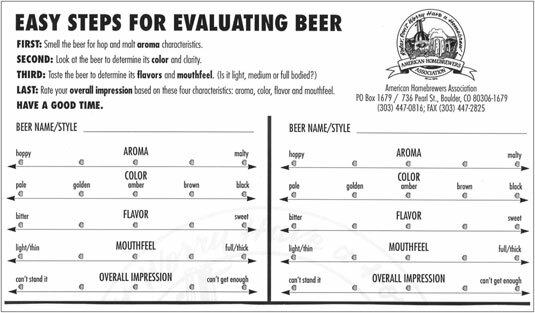 You don’t need to know the specific beer jargon to be a good beer evaluator; just record your observations in honest, straightforward, everyday language. What’s important is that you dissect each beer using your senses. What’s also important is that you try to set aside your personal biases and approach your task objectively. You may not like everything you smell or taste, but you’ll learn to identify those aromas and flavors that you like and dislike. A little humility and respect for the brewer goes a long way, too. Just because you don’t like a particular beer flavor or beer style doesn’t mean the brewer failed to make good beer. It just means that you haven’t acquired an appreciation for that flavor or style yet. Whether your goal is to become a beer judge, a beer writer, or a beer blogger, without established credentials as a beer evaluator, achieving credibility is tough. The best advice is to learn as much as you can as quickly as you can — and never stop learning. Read about beer, taste beer, visit breweries, discuss beer with others in the know. For a real education in this field of study, take up homebrewing. You don’t have to be a great brewer to learn a lot about the art and science of brewing. The beauty of all of this is that no matter which paths you take, you’re going to have fun!